The future for scientists using neutron scattering to observe the innermost structures deep within matter is both bright but curiously at the same time also rather gloomy. It is very bright on the one hand, thanks to the construction of the ESS, the European Spallation Source, in Lund, Sweden. This source, offering a level of brilliance never before achieved will open up new opportunities and will (it is hoped by all involved at least) make new phenomena visible which previously could not be studied (and thus open up a completely new field of physics). However, the ESS (according to the current planning status) will host just 20 instruments, so only a very small number of scientists will be granted access to measurement time there. All other experiments, which are not judged to be the best and most promising of their kind will have to be passed over to smaller neutron sources which unfortunately find themselves at the moment in a continuous decline. This is in essence the reason why in Europe the outlook is both bright and gloomy for neutron science. The medium flux neutron sources to be used in future to perform standard experiments, provide simple scientific capacity, develop instrumentation and train young researchers are being phased out one after the other with no concrete plans in sight to replace them. The main reason for this is that the old neutron sources have been or still are reactor-based sources. These research reactors are less problematic than nuclear power plants but their operation nevertheless is connected with a number of serious issues. One of the main problems (at least in Germany) is increasing operational costs if no supporting nuclear infrastructure is present, which makes their scientific usage increasingly uneconomical. Hence in Germany the phasing out of nuclear energy, although very little to do with the operation of research reactors, has indirectly brought about the demise of research reactors in science. In the cartoon, the talented artist Jacob Müller has aptly depicted this situation. The neutron landscape is shown as a pyramid. At the top, the ESS is under construction, the bright future of the community. It stands on the shoulders of the ILL in Grenoble (currently the most intense source), which itself stands on the basis of a user community served by local and national neutron sources. In the upper corner, abandoned in the sand, is the DIDO research reactor from Forschungszentrum Jülich, shut down in 2006. This represents the main challenge facing the neutron community. For even when the pyramid remains stable without the FRJ-2, a solid base for further construction is then lacking. 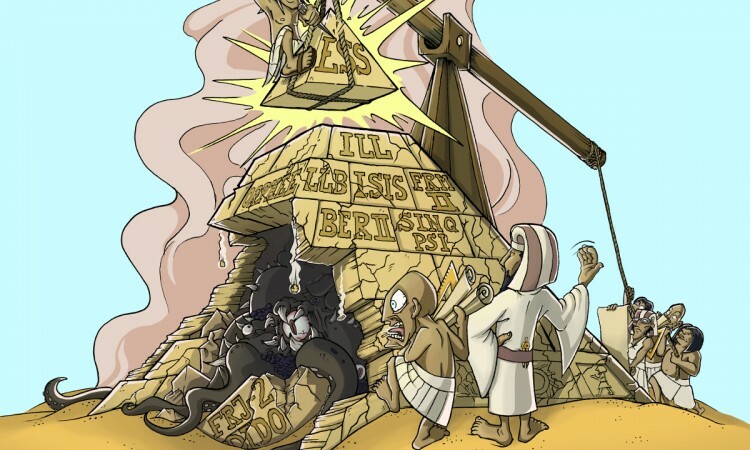 Furthermore, the cartoon shows that the next stones to be used in the construction are already crumbling, as the Orphée reactor near Paris will close in 2019 and the BER II in Berlin will follow in 2020. 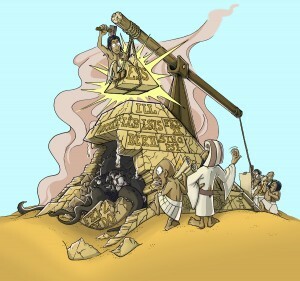 The instability of the pyramid will eventually lead to a lack of both capacity and young researchers in the field. As tremendous as the ESS will undoubtedly be, in the long run it can only develop its full potential if it rests on a solid base within the neutron infrastructure. So, that describes the current problem and here is our suggested solution. The disappearance of medium flux research reactors can be compensated by a network of local, high brilliance neutron sources based on accelerators. High brilliance sources can match the performance and quality of existing research reactors if optimised and work without requiring any nuclear material. In addition, one can use the same principle to develop smaller neutron sources of a size suitable for installation and operation at universities. In this way, a cutting-edge technology, available at the moment only at some large scale facilities, would gradually become standard equipment and would enable the development of a broad user basis. Referring back, then, to Müller’s picture of the neutron landscape, I would prefer perhaps to think of it not as a pyramid, but rather as an iceberg, projecting further out of the water the broader its base becomes.